Mission Repair centre is committed to deliver the highest in standards of technology repairs and customer service. We are on a mission to re-invent the retail landscape related to technology repair (smaller, more service oriented retail locations under one brand) - thus, one of the reasons for the name "Mission". One point of difference from other retail computer repair shops (who tend to be third wheels to retail / hardware sales locations) is that we do most, maybe all, of our repairs in house (or through our network of local contractors, most of whom are to be listed as members of the team). Our prices are extremely competitive with other shops and may even be less as we likely will spend less time on the repair (spent by inexperienced people). 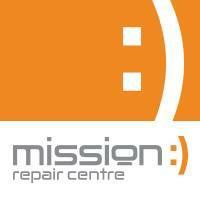 Mission Repair Centre are committed to providing competitive pricing and high standards of service. We provide a specialization of tech repair (not as an after-thought to retail sales), as well as the convenience of having a full range of technology repair services under one roof.